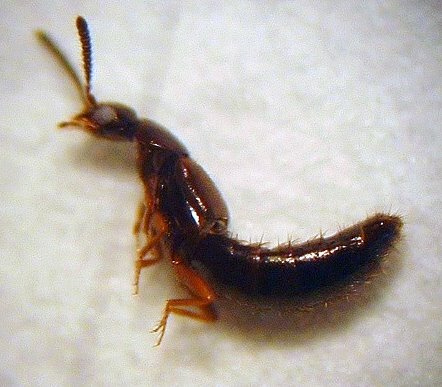 Previously called Atheta coriaria, Dalotia coriaria is a predatory rove beetle. It is thought to originate from Europe, but is now found throughout much of the world. It is a generalist predator of soil-dwelling organisms and has been available commercially since about 2003. Dalotia is a small, skinny black beetle about 3-4 mm long (figure 1). 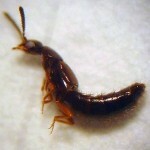 It somewhat resembles a small earwig, more than a beetle. The adult has short wing covers (less than the length of its body), and is a strong flier; flights generally occur at night the predator is often found on yellow sticky traps when populations are high. 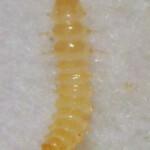 Larvae are long and yellow (figure 2). They have six legs and short antennae, which distinguishes them from other worm-like organisms in the substrate. It is a soil-dwelling insect; all life stages are spent in or on the growing medium of the crop. The beetle is very active and all larval stages and the adult are predatory. 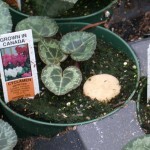 It occurs naturally in North America and is often found established in greenhouses without being deliberately introduced. At 26oC, Dalotia takes about 17 days from egg-adult. Adult longevity at the same temperature is about 48 (female) – 60 (male) days. Females lay an average of about 90 eggs, of which almost 70 survive to adulthood1. The beetle has a wide host range, but from a commercial greenhouse perspective, the most important prey are fungus gnats, thrips, and shoreflies. 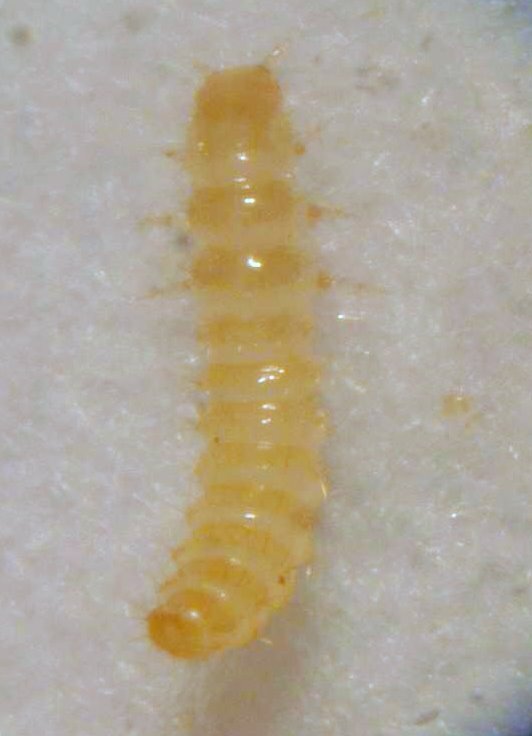 In the laboratory, adult Dalotia will consume up to 95 thrips larvae (2nd instar) and 78 pupae in 24 hours, if provided with no other prey choices2. Dalotia is usually packaged in cardboard tubes or bulk bags in quantities of 100-3000 insects, typically as a mixture of adults and larvae. The insects are very active and can be easily seen running on the substrate when the product arrives. One producer (Syngenta Bioline) sells Dalotia in breeder buckets which incorporate a substrate of coir and vermiculite and a supplied food source which allows growers to produce their own populations of the beetle in the greenhouse. Exit holes in the bucket allow the beetles to move into the greenhouse from the rearing bucket. Refer to the Grower Guide: quality assurance of biocontrol products to determine the quality of the Dalotia at receipt at the greenhouse. As active and strong fliers, Dalotia readily disperse throughout the greenhouse. Although they should be spread throughout the crop, it is not necessary for distribution to be even and consistent. It is recommended for application at a rate of between 1-5/m2 or up to 10/m2 for hot spots. 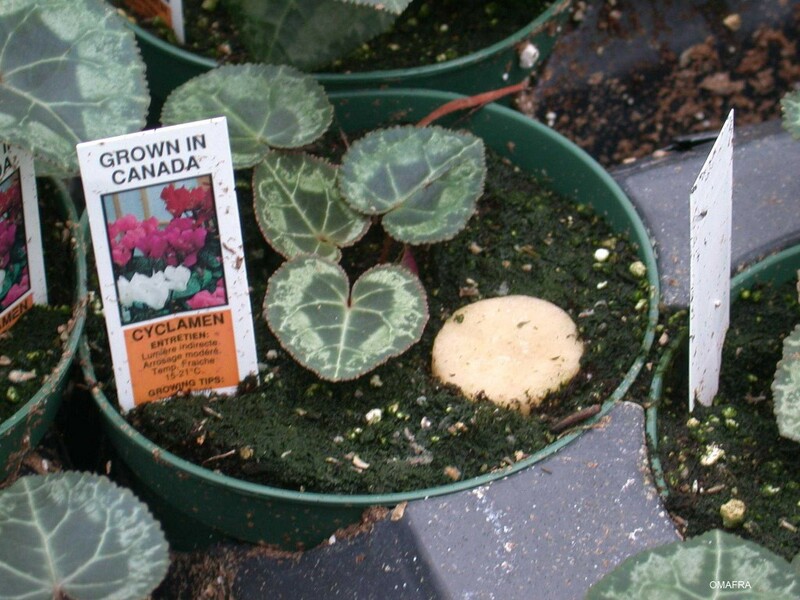 Because of its soil-dwelling nature, Dalotia is less affected by ambient environmental conditions than many other BCAs used in the greenhouse. Cool temperatures will slow down its activity, but it will not be killed even by intense cold, surviving Ontario winters outside by moving deeper into the soil. It does not diapause and will remain active in the greenhouse year round. Yellow sticky cards will occasionally catch flying adults, especially when populations are high. Likewise, adults are sometimes seen on greenhouse walls. Adults and larvae can be observed actively moving on the surface of the growing medium or between the wall of pots and the soil. Potato slices, which are sometimes used to monitor soil populations of fungus gnat larvae (laying them on top of the medium and inspecting the underside for fungus gnat larvae 24-48 hours later) may also provide information on Dalotia levels (figure 3). Whether Dalotia are attracted to the potato itself or to fungus gnat larvae feeding on the potato, is not known. Dusting the underside of the potato slice with ground fish food may enhance attraction. For thrips, Dalotia is often used in conjunction with other soil applied BCAs such as predatory mites, nematodes and entomopathogenic fungi. It should always be combined with BCAs that target foliar thrips stages. Evidence of intraguild predation on soil-dwelling predatory mites has been shown in laboratory trials3. However, interactions in commercial greenhouse crops do not usually impact the efficacy of biocontrol. Wilson, E.R.E, 2012 Life cycle of the rove beetle, Atheta coriaria (Kraatz) (Coleoptera: Staphylinidae) and suitability as a biological control agent against the fungus gnat, Bradysia sp. nr. coprophila (Lintner). PhD Dissertation Kansas State University. Carney VA, Diamond JC, Murphy GD, Marshall D. 2002. The potential of Atheta coriaria (Kraatz) (Coleoptera: Staphylinidae) as a biological control agent for use in greenhouse crops. IOBC/wprs Bulletin 25(1): 37-40. Jandricic SE, Scott-Dupree CD, Broadbent AB, Harris CR, Murphy G. 2006. Compatibility of Atheta coriaria with other biological control agents and reduced-risk pesticides used in greenhouse floriculture IPM programs for fungus gnats. The Canadian Entomologist 138: 712-722.